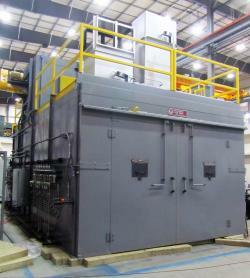 Wisconsin Oven Corporation shipped two (2) Electrically Heated Ultimate Duty Composite Curing Ovens to a North African composites manufacturer. The composite curing ovens will be used for curing honeycomb composite material. The maximum operating temperature of these curing ovens is 500°F and the work chamber dimensions are 8’0” W x 22’0” L X 6’0” H. These curing ovens are designed with the capability to heat 1,500 pounds of steel/aluminum and 50 pounds of composite material from 70° to 350° F at an average of 15° F per minute. Both the curing oven bodies are constructed with bi-parting, side-hinged, horizontal swing doors at one (1) end. The recirculation system features combination airflow which maximizes heating rates and temperature uniformity of these products. The customer required guaranteed temperature uniformity of ±5° F at set points of 250° F and 350° F with the recirculation blowers operating at full speed to meet BAC 5621, Class 1 requirements. These composite curing ovens were fully factory tested and adjusted prior to shipment from our facility. All safety interlocks are checked for proper operation and the equipment is operated at the normal and maximum operating temperatures. An extensive quality assurance check list was completed to ensure the equipment met all Wisconsin Oven quality standards. This equipment is backed by Wisconsin Oven’s Exclusive and Unprecedented 3-Year WOW™ warranty (parts only).